In the latest version of Yoast SEO Premium, we’ve released a new feature: synonyms. In the next months, you can expect even more updates making our SEO analysis smarter and more advanced. These changes will help you to write awesome, engaging content that’ll rank in the search engines. In this post, I’ll explain to you why we added synonyms to Yoast SEO and what changes lie ahead. Google is getting really good at understanding what texts are about. If you want to rank for a certain term, for example for ‘SEO’, Google will know that ‘Search Engine Optimization’ is pretty much the same thing. It makes sense to use them both. Synonyms make sure a text is nice and easy to read. A few years ago, we added the multiple focus keyword functionality to Yoast SEO. Multiple focus keywords were often used to optimize for synonyms as well. We feel that the new synonym-functionality is a better solution to optimize for synonyms. Read my post about the difference between multiple focus keywords and synonyms if you want to know more. Why is the exact match focus keyword still important? Google understands synonyms, but that does not mean that focus keywords are not important anymore. Every SEO strategy should start with keyword research. You should know what words your audience is using when they are searching. The exact match keyword should be the keyword or keyphrase that your audience is using most often. That’s also the thing they expect to find. The exact match is always a little bit more important than the synonyms, just because your audience uses these words instead of others. Vocabulary people are using is important. If people are searching for volunteering, they’ll probably not click on civic participation, although the two are supposed to be synonyms. Some words are more high-end than others and might not fit your audience as well. In your keyword research, you should take this into account. What words are your audience using? In our SEO analysis, we’ll treat the exact match focus keyword different from the synonyms. Read more about that in our release post. Along with the new support for synonyms, we’ve added a new keyword distribution check. Before, we would just count how often you used the keyword with our keyword density check. If you used it 4 or 5 times in the first paragraph and then never again, you could have gotten all green bullets from us. That’s no longer true. We now have a check to see whether you’ve distributed your use of your focus keyword (or its synonyms) evenly across the text. This makes sure you stay on topic throughout your text, which will increase your chance of ranking. Context is the SEO word of 2018. Google is getting really good at determining what a text is about. Google understands plurals and singulars. It has a related entities database. We’re working hard to make Yoast just as smart as Google is. We now released our keyword distribution check in which synonyms are taken into account. We’re currently determining in which other checks we should take synonyms into account as well. Of course, we’re open for suggestions and opinions. In the past weeks, our awesome developers have built morphology recognition. This enables our analysis to recognize singulars, plurals, and other forms of the same word. So, if you want to rank for the focus keyword ‘link’, Yoast SEO will (in the near future) recognize ‘links’ and ‘linking’ as a similar keyword. We’ve built this for English and are planning to do so for more languages. We’re currently testing how to integrate this new morphology recognition into our SEO analysis. The multiple focus keyword functionality is not optimal yet. In the near future, we’ll change this functionality into related keywords. You can optimize your post for a specific keyword and take synonyms into account. Next to that, you can optimize for related keywords. These are not your main keywords and not exact synonyms, but you still want to use them regularly. We know that Google has a related entities database. If you’re searching for ‘tagliatelli’, results with the words ‘spaghetti’ and ‘pasta’ could also turn up. It’s smart to focus on related keywords when you’re writing a post. So, if your post is about ‘tagliatelli’, including ‘pasta’ and ‘spaghetti’ will probably help in your ranking as well. We are currently working on modifying our multiple focus keyword functionality into related keyword functionality. In the past year, we’ve been working on a recalibration of our SEO analysis. Many of the checks in our SEO-analysis were established based on our own experience in the SEO industry. We wanted to be able to account for every check in our analysis more thoroughly. A team of linguists, developers, and SEO-experts dove into scientific literature and SEO blogs in order to re-assess all of our checks. The recalibration resulted in some changes in the checks of our analysis. For instance: the keyword distribution check was added as a result of it. We’re planning to release the new SEO analysis in September of this year. Context is gaining importance in 2018. That’s why we invest heavily in improving our SEO analysis. At the end of this year, we can really account for context in your blog posts and articles. This could mean that some of your articles that get green bullets now, will have orange or red bullets later on. That does not mean that your content became worse. It only means that we’re able to give you better, smarter feedback on your writing. 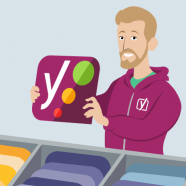 The post Synonyms and keyword distribution in Yoast SEO Premium appeared first on Yoast.